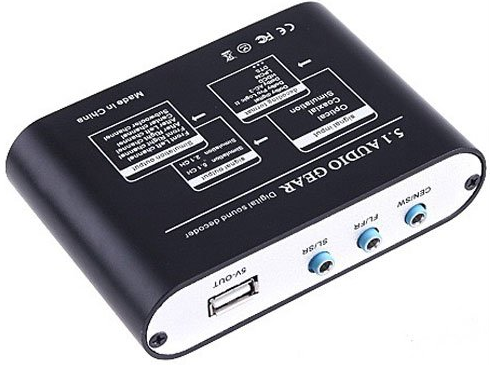 » Digital sound decoder 5.1 Digital sound decoder 2.0, 2 + 1, connect the speakers without a digital audio input. Digital sound decoder 5.1 Digital sound decoder 2.0, 2 + 1, connect the speakers without a digital audio input. There is a TV with HDMI inputs and digital audio output. Separately st and acoustics 5.1 but are only designed for reception of low-frequency audio signal in 5.1, these two devices connect to each other. Connect a cable will not work as a single device, we have access to the digital format, and the other analog input is designed to receive the audible spectrum that is the LF signal. For these devices it is necessary to apply the conversion between device (AV decoder). The computer performs the function of the audio decoder sound card. Loudspeakers 5.1 systems are designed to connect to a sound card. On the sound card is for audio output connector has three similar connectors such as headphone. 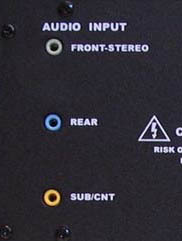 On loudspeakers such as the three connectors. Why three, one connector allows you to transmit two audio channels. In the photo below you can see similar inputs on acoustics. So we have speakers so consider using AV receivers will not be considered, but is short we can say that the device to which is fed a digital audio signal is converted to a low-frequency signal is amplified (as part of the amplifier) to the receiver and connected speakers. We also need a converter, the acoustic signal amplifier is unnecessary, it is we already have in acoustics. To convert audio decoder can be used, but the famous company of such equipment does not produce, they produce media players that have more advanced features. Decoders 5.1 Chinese companies produce the cost of such a device is about $ 55. Submitting to it via an optical or electrical digital audio junction, convert it into a low frequency audible range, and then transferred to the active speakers. Devices can be bought in China. As a result, you can collect the following wiring diagram (→ TV Decoder 5.1 → acoustics). The application decoder has its advantages, many TVs do not support the playback of audio tracks in DTS format, but this format recently increasingly gaining popularity and is not uncommon when if you want to see high-quality film on a network or removable media is that the image is, but unfortunately there is no sound. Many decoders support DTS format.